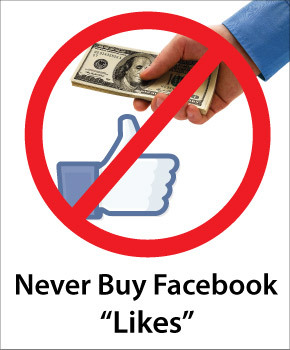 If you are a Facebook page owner heed this small piece of advice from me before you drop a dime on any Facebook Likes. "Please do NOT buy Facebook Likes!" I say this after such a bad experience with a purchase I made for 25 Likes. Let me tell you why. On a popular website — that shall remain nameless — I bought 25 "Real" Likes for a mere $5. Why? I read how others did it and at that time there many viable reasons why it was a good idea. One reason being that you needed to have at least 25 fans before you could claim a custom URL for your page. So paying a mere $5 to claim your vanity URL was not that much, in comparison to waiting days, weeks, or months to get 25 fans on your new page. But little did I know that the Likes that you are paying for aren't really REAL people. Initially, I was happy with the purchase of Likes I made. I received the 25 Likes in a matter of hours. Yet it wasn't until a few months to a year later that I realized it wasn't worth the $5. There are several reasons why you should not purchase Facebook Likes but below are the two biggest reasons from my own experience. Facebook is cracking down on fake accounts. – About 99% of the time when you buy Likes you are getting Likes from fake Facebook profiles that the seller has setup. When Facebook shuts down that account, there goes one of your Likes. These Likes don't engage your page. – You know how important it is to have fan engagement on your page. Especially for newcomers who visit your page, it's a sign that you have a lively page. Well when you buy Facebook Likes, the problem is that those Likes don't engage your page. Therefore to other people, it can give off a bad connotation that you have a lot of Likes but no one cares to participate on your page. Which may not be the case but that's the way it will appear. Or on the otherhand, to Facebook, it will appear that you have a low EdgeRank. And that can be detrimental to a page! Use Facebook Advertising/Ads - "This worked really well for me." 5 Easy Online Ways to Generate "Likes"